Each month, we service 20 to 30 pond filters and make many more trips to customers' place to treat sick koi, medicate pond water and many other pond related jobs. 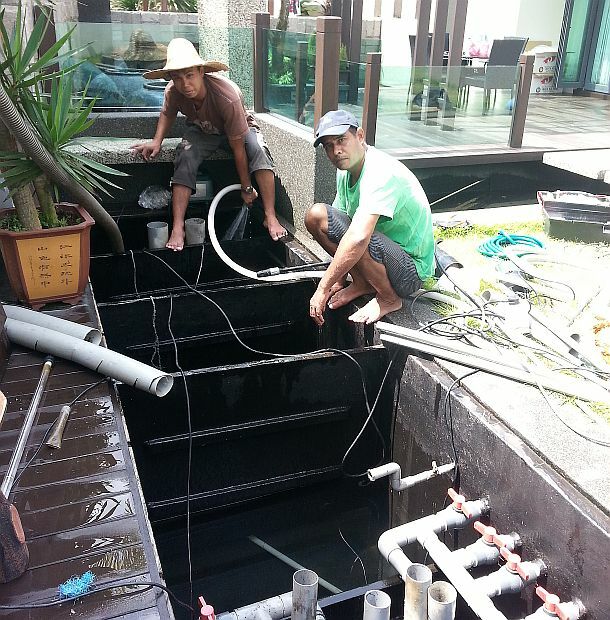 We recommend servicing your koi pond filter once 6 to 9 months depending on number of koi, feeding regime adopted by customers and filter size and design. Our charges are between RM250 to RM550 depending on the size of filter. The charges are inclusive of anti chlorine and salt but exclude consumables like replacing UV light, coral or filter mat. Prior arrangement is required as we would want customer to fast their koi for 3 days before we carry out the servicing work. Unless an emergency situation, we would normally prefer to carry the servicing work arriving at customer's place in the morning arriving between 8.30 to 9.00 am. 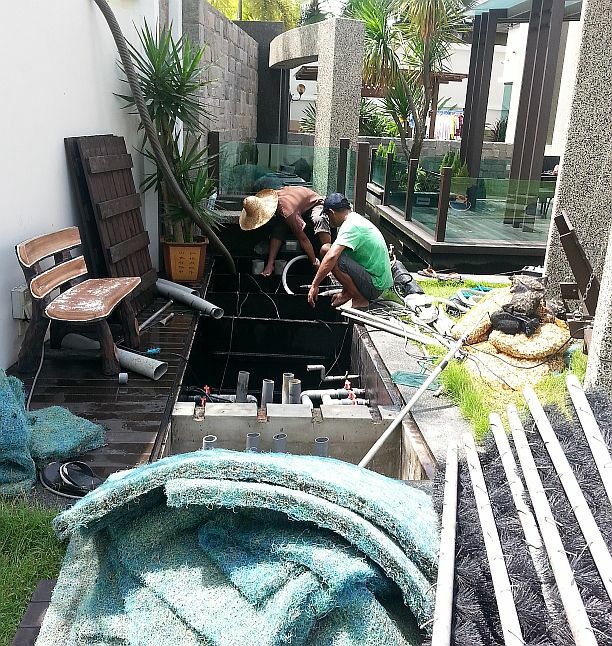 Service pond filter involves removing all filter media from the filter chambers, clean them with pond water and most importantly flush out accumulated wastes from the concealed pipes. It normally takes about 2 to 3 hours to have the works completed. When we are done, someone at home need to be around until the pond water is filled, to load in anti-chlorine pallets as the water is being filled and to turn on the water pumps. Pond and water features are usually given minor touch ups. If the whole pond requires complete cleaning due to overgrown algae then it would be separate charges. It takes almost the whole day for 2 persons to complete such a job (pond and filter) where your koi in the pond have to be rounded up and packed using plastic bags and then kept alive with oxygen pumped into the bag.